These Three Cheese Gourmet Wafers are thin, crispy, cracking and full of flavor. 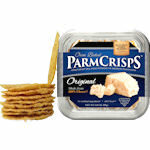 A combination of the full bodied flavors of Parmesan, Mozzarella and Cheddar for a rich cheese taste. 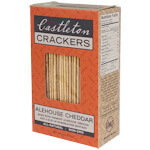 These crackers are great as a snack, or to serve with cheese and jam, fruit paste, tapenade. They are also wonderful with dips and salsa or with a salad. 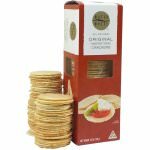 New Zealand-made Gourmet Wafers combine wonderful natural flavors with a crisp, lightly baked texture to create a fantastic taste experience. 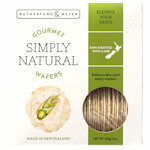 Rutherford & Meyer make these sensational wafers, made from the highest quality natural ingredients. 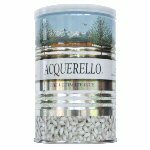 They are low in fat, and low in trans fatty acids. Ingredients: Wheat flour, cheddar, mozzarella, parmesan (pasteurized milk, salt, dairy cultures, microbial rennet), salt, rice bran oil.